Attendees at the Independent Film Festival Boston on Sunday, April 29 are in for a special treat. Screening that afternoon at 12:45 will be a work-in-progress version of co-directors Tim O’Donnell’s and Jon Mercer’s documentary film “Life Without Basketball.” We recently chatted with Tim and Jon about how this project, which started in 2014, came to fruition and what their plans are for hitting the festival circuit this coming summer. “Life Without Basketball” tells the story of record-breaking student basketball player Bilqis Abdul-Qaadir. 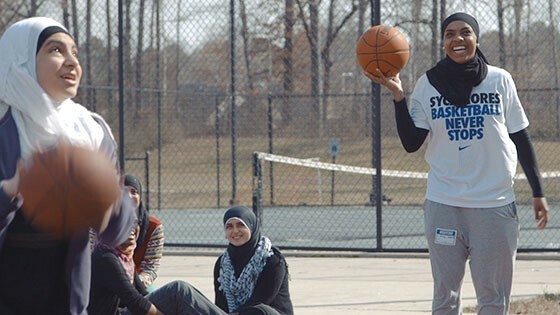 Hailing from Springfield, MA and raised to follow the Quran, Bilqis has worn the traditional Muslim hijab, and covered her arms and legs, since the age of 14–both on and off the court. During high school she established herself as a basketball marvel, averaging more than 40 points per game in her senior year. Her talents attracted the attention of several NCAA Division I schools and she eventually played for Indiana State, and later, Memphis State. While playing in both college basketball programs she continued to play “covered,” wearing a hijab along with long-sleeves and pants beneath her basketball uniform. Bilqis’ story was picked up by the national media, which led to the first of two invitations to the Obama White House. During her second visit she even went one-on-one with the Commander-in-Chief. However, when Bilqis began pursuing her goal to play professionally on the international circuit, she was informed that FIBA (basketball’s international governing body) had banned headscarves from international competition. Tim and Jon shared that FIBA’s original reason for banning the headscarves was that they wanted to keep their games “religiously neutral.” But when it was pointed out that other players sported cross tattoos and the like, FIBA took the position that the headscarf ban was for “safety” reasons. The news came as a shock. By barring an essential element of her faith tradition, FIBA’s rule had seemingly put Bilqis’s hoop dreams just out of grasp. And this dilemma is what forms the crux of “Life Without Basketball”. O’Donnell and Mercer, friends since junior high but first-time co-directors, maintain that their film is much more than a sports story. It is, rather, a tale about how one proceeds when confronted with having to make a crucial, defining choice. In Bilqis’ case, this choice involved walking away from a game she loved and excelled at, or renouncing her devotion to and affiliation with, a way of life and faith she had known since birth. “Life Without Basketball” goes on to follow Bilqis as she begins training the next generation of Muslim girls at an Islamic school’s athletic program, the first of its kind. Further, the film explores layers of identity and the complex challenges of being Muslim in America, where family tradition and public perception are often at odds. Filmmakers Collaborative is proud of the support, through fiscal sponsorship and via its vital community of fellow filmmakers, O’Donnell and Mercer drew from the organization. Both filmmakers were particularly enthusiastic about an opportunity they had to practice their pitch at an FC event in 2017. Following the April 29 screening at IFFBoston, O’Donnell and Mercer plan on putting the finishing touches on their film (including continuing to raise funds) and having it ready for entry into film festivals over the upcoming summer and fall.